There are a number of ways to cook butternut squash. Leave it to my mom, she found the easiest, most flavorful way to do it and I am going to share it with you. Yes, my mom was a really good cook. She was so tickled when she discovered the oven method. It was one of those “where have you been all my life?” moments. 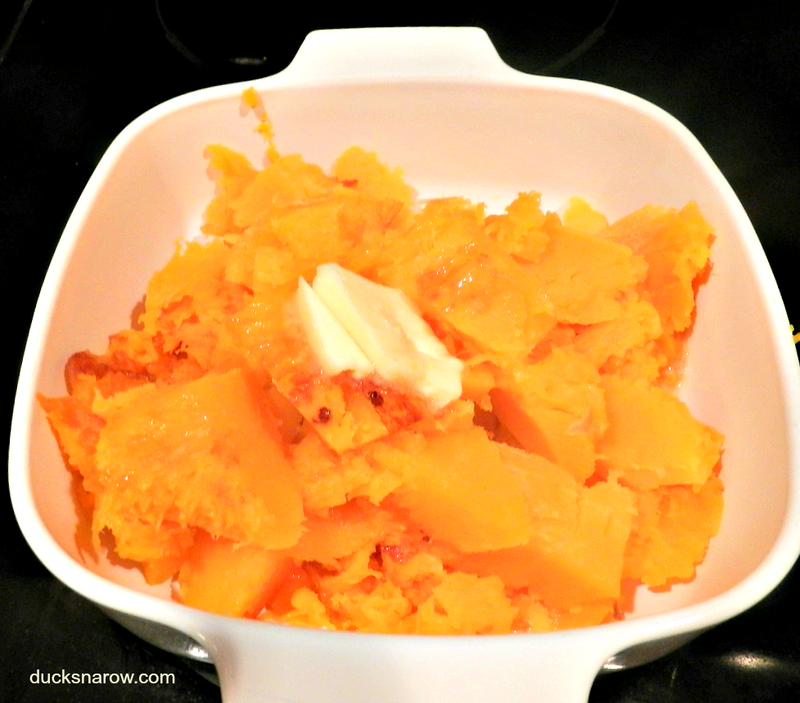 Baking butternut squash in the oven requires less preparation and is the most flavorful. When I make it to accompany a big holiday dinner, I usually make it a day ahead and rewarm it in the microwave when it is time to serve. Depending on the quality of the squash itself, it is unlikely that you will need to add any sweetener. It is plenty sweet all by itself. I prefer to add just a little bit of butter. Delicious! 1. Cut the end with the stem off and discard. 2. Cut the squash in half, lengthwise. 3. Scoop out the seeds and throw them away. 4. Place the squash, flat-side down on a foil lined baking sheet. Remove from oven and cool so that it can be handled. 5. 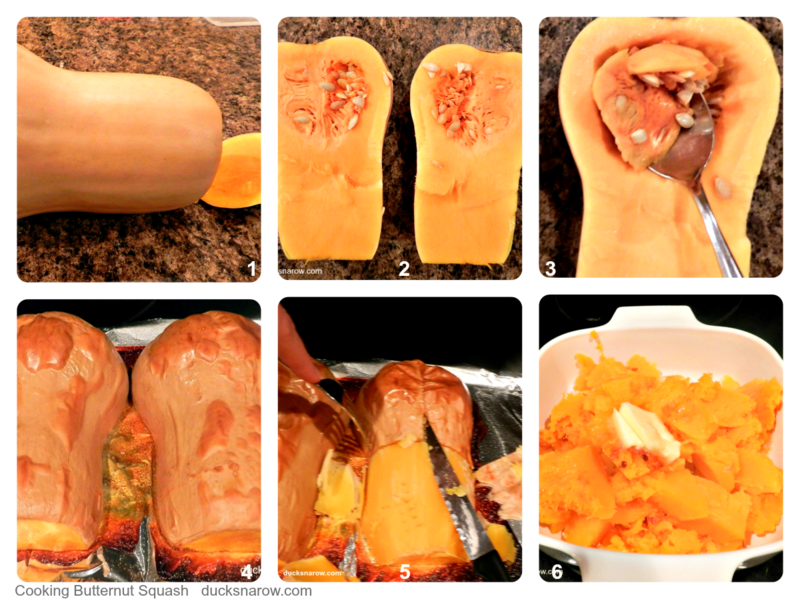 Using a fork and knife, peel the skin off the outside of the squash. Cut the “meat” of the squash into chunks and place in a microwave safe baking dish. 6. Add 1 T. butter (or more) and mash. Serve or refrigerate to reheat for later. One large squash serves 4 people. 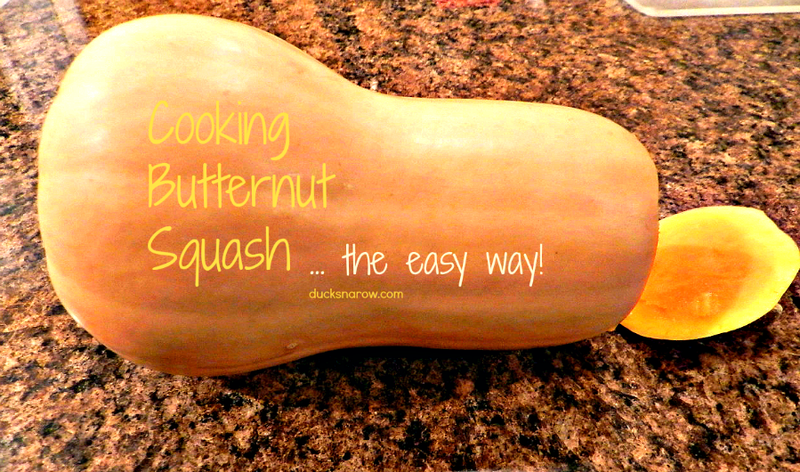 We enjoy butternut squash all winter long but I especially like to serve it with holiday meals. It is the perfect compliment to a traditional turkey dinner. I use this same method!! Thanks for sharing with #HomeMattersParty!